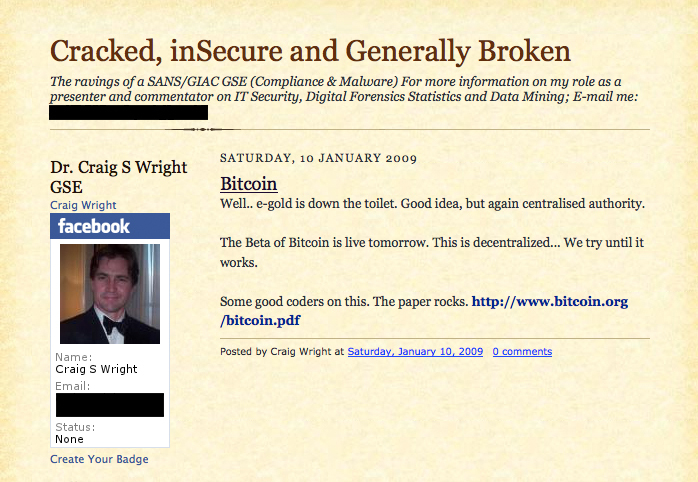 The global investigation to discover the true identity of Satoshi Nakamoto seems to have come to an end by pointing out a 44 years old australian IT security business man named Craig Steven Wright. The search for Satoshi Nakamoto has been going on for at least five years now, but the quest is now probably over, after new evidence including blog posts, emails and accounting statements, has been leaked by an anonymous source to tech websites Gizmodo and Wired. Satoshi Nakamoto is the owner of over one million Bitcoins, which, with the price level at time of writing, equals to $400 million USD. The truth is probably less exotic than we imagined, as the inventor of Bitcoin is far from being a secluded, unsuccessful physician/engineer of japanese origins, but a much more ordinary Australian business man. The anonymous source gave proofs going from a clear blog post date 10th January 2009 to a PGP key Satoshi required people from the project to use, passing through his ex-wife claim that he was working on “digital money”, his use of email [emailprotected], an address used in early development Stages by Satoshi Nakamoto, and his activity in lobbying in the Australian Taxation Office in regards to a new technology. On Wednesday 9th December, Craig’s house was raided by the police. Incidentally, just hours after the release of the reports by the Gizmodo and Wired websites, but police officers claim the raid has nothing to do with Craig’s association to the creation of Bitcoin. As much as this could be the source of his troubles, it can be also seen as another clue towards the possibility of Craig Wright being the inventor of Bitcoin. Not that there’s anything wrong with it, but it surely is emblematic of his ego. But then, if he is Satoshi, why had he chosen to remove himself from a revolutionary idea like Bitcoin? However, all the proofs are still “circumstantial”. At the moment, there’s no definitive evidence. All of these “proofs” could have been made up by somebody, even though imagining his objective for producing such an elaborated and well built intrigue, is difficult. And regarding the evidence of tax lobbying, mouths are still sealed up. So no personal declaration has been made, from anybody, with no witness in sight. The Bitcoin population is split around 50/50 on whether Craig Steven Wright is Satoshi Nakamoto or not.